The “We Always Swing” Jazz Series invites mid-Missouri to join us October 15-17 for “A Chunk of Monk” – A celebration of the iconoclastic jazz pianist and composer Thelonious Sphere Monk. 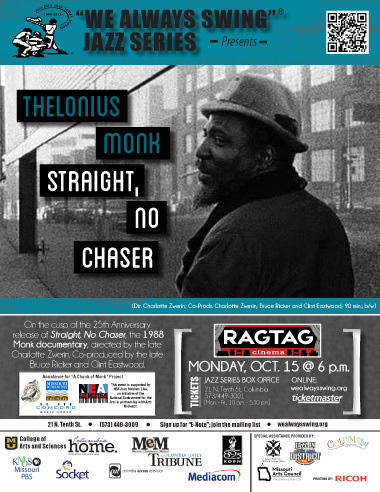 It all starts Monday, October 15 at 6 p.m. with the screening of the documentary STRAIGHT, NO CHASER at Ragtag Cinema. At the time of its release Stephen Holden of The New York Times wrote, ”The film’s late-1960s portions, which document a European tour and also catch Monk playing in clubs and in recording sessions, are some of the most valuable jazz sequences ever shot… The Monk music that courses through the film is extraordinary in its range of feeling…” Tickets for the film are available from the Jazz Series box office. The celebration continues Tuesday, October 16 when NEA Jazz Master Kenny Barron teaches “INTERPRETING & RE-INTERPRETING THELONIOUS MONK” at Piano Distributors. Starting at 4:30 p.m., the master class is FREE to all students (Junior High – University) and $8 for the public. Space is limited, so please call the Jazz Series to reserve your spot. Later that evening we’re back at it with “THELONIOUS MONK: THE LIFE AND TIMES OF AN AMERICAN ORIGINAL” – a panel discussion featuring Kenny Barron; Robin D. G. Kelley, Gary B. Nash Professor of American History at UCLA and author of the acclaimed biography Thelonious Monk: The Life And Times Of An American Original; and Gerald Early, likewise a nationally known author, critic and essayist who holds the positions of Merle Kling Professor of Letters and Director at the Center for the Humanities at Washington University in St. Louis. Starting at 7:30 p.m. in Fisher Auditorium, MU School of Journalism, the discussion is FREE, but space is limited. Please call the Jazz Series to make reservations. 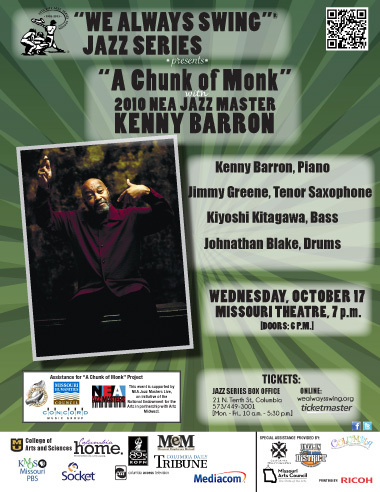 “A Chunk of Monk” culminates Wednesday, October 17 when Kenny Barron Quartet plays the Missouri Theatre at 7 p.m. (6 p.m. doors) The all-star group will bring the music of Thelonious Monk to life for one special evening. Tickets available through the Jazz Series or Ticketmaster. For more information, please visit our website, stop by our new office at 21 N. Tenth Street, or give us a call at 573-449-3009. Many thanks to Josh Chittum with the We Always Swing Jazz Series for submitting this guest blog post.